In the morning, drive to the Wild Horse National park working to re-introduce the Takhior the Przhevalsky horse. This beautiful park also hosts number of archeological relics including a deer stone and 7th century Turkik monuments. In the morning, drive back to Irkutsk for your afternoon flight to Irkutsk. Transfer to Empire hotel or similar. 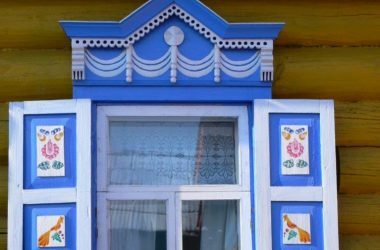 Explore Irkutsk and its excellent museums in the morning. Then, drive to Listvyanka,a village located in the South-west bank of Lake Baikal.Visit the Baikal and fish and freshwater seals. Transfer back to Irkutsk. Spend these days visiting the “heart” of Baikal, the amazing Olkhon island. Enjoy a ferry ride to the island village and visit the highlights of the area. Overnight at hotel. With weather allowing, we will enjoy a day trip on ferr to the Ushkanye islands, the home of world’s only fresh water seals. With an assistance of an experienced national park ranger, you will explore the islands and observe the unique mammals of the lake. Overnight at hotel. In the afternoon, catch a hydrofoil to travel back to Irkutsk. 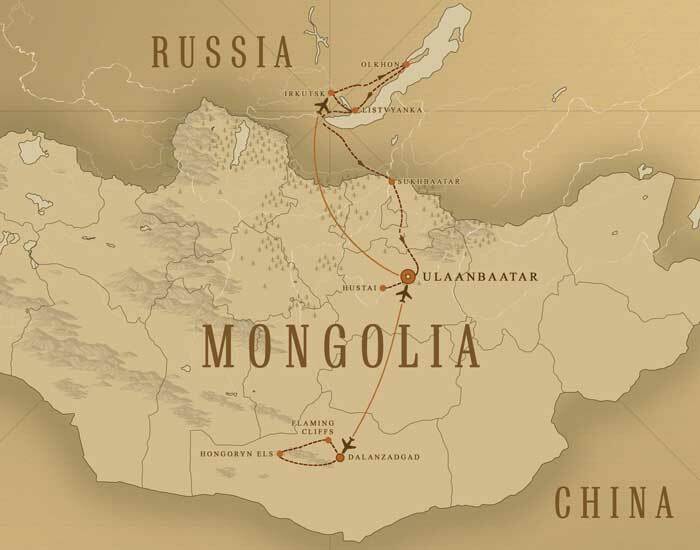 Enjoy a farewell dinner and board your train in the evening to Mongolia for our next part of the adventure. Spend the next day traveling on board the train. Early in the morning, arrive at the train station in Ulaanbaatar. In the afternoon, visit the National History and Fine Arts museums. Enjoy a dinner with a Mongolian historian to talk about Mongolia’s past and present challanges. Fly over the vast Gobi desert, to arrive at the Gobi Gurvan Saikhan National Park. Visit the Yol Valley and hike in the gorge. 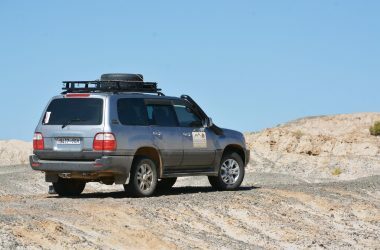 In the morning, drive to the magnificent Hongoryn Els, the largest of the sand dunes in the Gobi. Hike in the dunes and enjoy riding camels. Drive back to your base camp. En route, explore the pre-historic Havtsgait petroglyphs site. Hundreds of ancient rock drawings are found on the top of a mountain. In the afternoon, explore the legendary Flaming Cliffs where the first dinosaur eggs the world had ever seen were found. This trip requires a single entry visa for Russia. The visa invitation letter will be sent upon signing-up for the trip. The trip begins in the Mongolian capital Ulaanbaatar. 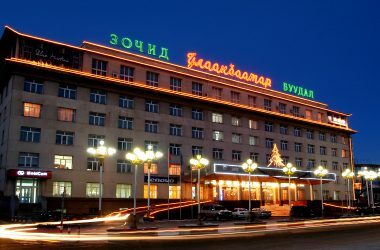 Travel to Russia is by flight on Mongolian domestic airline and the return journey from Russia is by train which takes 2 days to arriva back in Ulaanbaatar. All train compartments are 4 berth standard rooms. Most nationals do not need a travel visa to enter Mongolia. This and more information will be included in your pre-departure information. 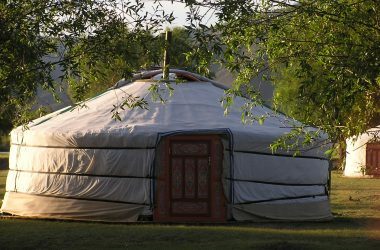 Why not extend your journey and explore Mongolia’d highest national park and roof of Mongolia. The majestic Altai Tavan Bogd, or the “Five Peaks of the Altai Mountains”, located on the very edge of the western border with Russia and Kazakhstan. It is home to the local kazakh who came to settle in the area in the late 1800. Kazakhs train Golden Eagles for hunting and Kazakh embroideries are some of the finest in Central Asia. During this trip, we will also meet and explore the ethnic Uriankhai and Tuvan nomads and learn how archery is still practiced among them. Come to explore this unique land while enjoying trekking at this majestic national park. Most hotels in Siberia were built in the Soviet era so they are reminiscent of the old Soviet Russian architecture. They are clean, comfortable and cozy. Of course don’t miss a chance to use Russian banyas found in the smaller villages.